Take a look at a new and improved ice rink thanks to a dazzling blue handrail! 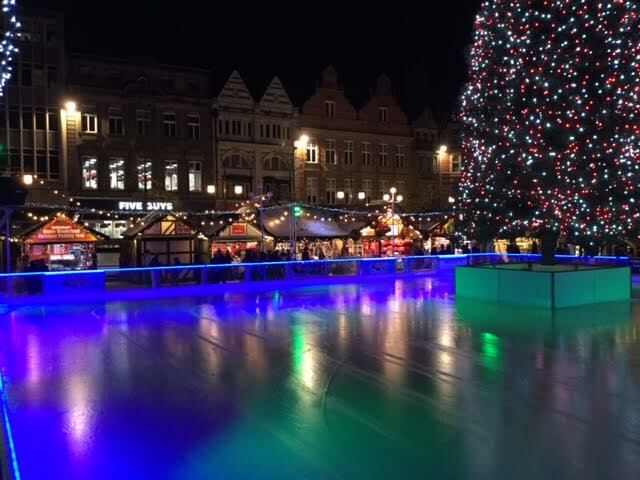 Arena Ice install & maintain temporary ice rink hire to city centres, retail outlets and leisure destinations giving the opportunity to increase footfall and generate additional revenue during the winter season. Made from real ice, Arena Ice’s varying ice rinks are proven to increase customer dwell time- not to mention improving that all-important family experience. This year Arena Ice launched new innovative LED lighting technology and installed under hand rail LEDs to illuminate the perimeter of the rink. LED lighting is a low energy, low-temperature technology, compatible with maintaining low temperatures for ice rinks. Digital control means colour changes and moving dynamics can be added. LED Illuminations (2009) Ltd worked closely with Neil Munn to provide a bespoke IP66 LED strip light in blue which fits the underside of the perimeter handrail. The LED ribbon has 120 x 3528 LED/m which is housed in a silicon tube. To accommodate the entrance gates to the ice rink, lengths were manufactured with a 1.5m power cable to a 2.15m of LED ribbon, a 200mm integral interconnecting cable (allowing for the installation to bend at the gate hinge) with another 4m length of LED ribbon completing the run. The hand rail was capped off with a frosted diffuser. Starting with the concept of a LED illuminated hand rail, LED Illuminations did not only provide what he wanted but suggested options which made the installation and break-down at the end of the season much easier. Any project of this size will without question throw up a number of challenges – all of which have been overcome without fuss and with clear communication. This year Arena Ice have rinks at The Natural History Museum, Hampton Court Palace, Canary Wharf, Birmingham Centenary Square, Bath, Whitehall Garden Centre, Van Hage Garden Centre and many more cities and landmarks within the UK.